The lawyers and staff at Day Rettig Martin, P.C. 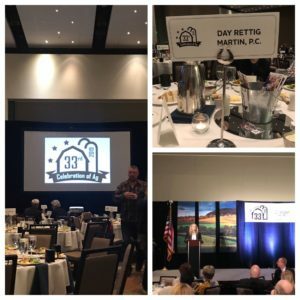 enjoyed the 33rd Annual Celebration of Agriculture on March 18, 2019. Keynote speaker Tyne Morgan spoke about the future of farming, in addition to the revival of bacon. This year the Celebration of Agriculture raised over $4,000 for HACAP Food Reservoir. All of us at Day Rettig Martin, P.C. were glad to be able to contribute to that worthy cause. Attorney Ron Martin focuses his career on helping Iowa Family Farmers. Therefore he attends events such as this to help him remain connected with the local farming community. If you have questions about financial matters, bankruptcy, or the future of your farm, come to the law firm with experience in agriculture law.